Young leaders play an important role across Derbyshire and projects such as the Derbyshire Young Coaches Academy are helping those talented teenagers on their way. 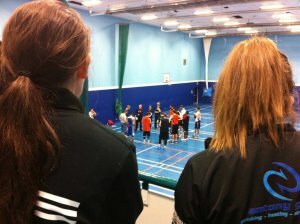 Derby City School Sport Partnership (SSP) were asked by leading young people national charity, Youth Sport Trust (YST) to deliver a Derby City Young Coaches Academy during the 2015-16 academic year. A total of 25 young leaders from across secondary schools in Derbyshire signed up for the academy, all between the ages of 14 and 19 years old. It has enabled all of them to start out on their journey of developing as a coach in local community clubs. 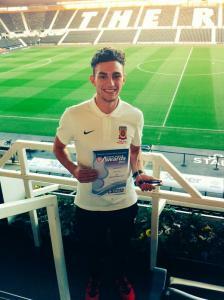 Liam Drake is School Sport Officer for Derby City SSP and is well placed to explain the structure of the academy. "The programme consists of a number of workshops based around session planning and the ethics and philosophies of coaching, as well as masterclass sessions," he says. "The programme also assists with target setting for their future development and signposting towards further opportunities and courses." 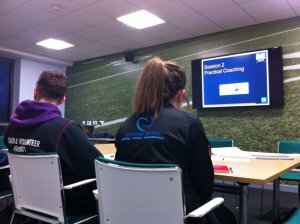 The Derbyshire Young Coaches Academy was introduced to give the leaders a different environment to learn within - and benefit from the expertise and knowledge from experienced community coaches at the same time. During their first session together, the group heard from Derbyshire's Young Leader of the Year 2014-15, Sam James, himself a young coach, who spoke about his own experiences and coaching development, along with Lauren Asquith from Derby County Community Trust. The first practical session saw the leaders taking part in a masterclass with local basketball coach for the Derby Trailblazers, Matt Shaw. There was also a county level badminton session and one practical is still to come that will focus upon coaching disabled people in sport. Liam says the approach to the academy is simple. "We wanted to provide our young leaders with an opportunity to develop transferable skills as they all coach within different sports," he adds. "The majority of our leaders coach in a community club in a variety of sports, from football to equestrian; it was about showing them a coaching environment in a different sport and applying that to their own one." Liam believes there is much value in being able to observe an experienced coach in action. "Through observing Matt's Basketball session, the leaders were able to watch a high quality session and be shown a session plan be put into practice," he says. "We ran a theory-based session initially that focused around how to plan and then we took the leaders into the practical session and saw how Matt put his session into practice. Liam outlined the importance of using technology to support coaching sessions. "One of the things that the leaders enjoyed the most about the session with Matt was being able to see the different ways that a coach can use technology." he says. "During the basketball training session, they were able to take pictures on their phones of Matt in action with his players; they also took notes and videos from their phones so that they could take them away and look over them at home. "Matt also uses an iPad for match analysis that is available court side for players to come over and watch themselves back on; all of this gave the leaders ideas of how they could implement something similar into their own coaching session back at their club." As the majority of young coaches have already been active in their local community club, the main aim of the academy has been to support them on that journey. Olivia Gara, one of the young coaches explains what she thought about the experience: "The young coaching academy has been great, I've definitely learnt a lot and have taken a lot from it and I've enjoyed every second." There are hundreds of young people that come through Leadership Academies across Derbyshire each year and this specialised academy has been a great way to showcase their talents and value. Young people such as the ones to have come through this coaching academy play a big part in their community clubs. SSPs across Derbyshire, including Derby City, offer opportunities throughout the academic year for young leaders to support school based competitions. Throughout this time, they embark on training workshops and courses to help them develop in different areas; all helping to give them the skills and knowledge to continue their volunteering in a community setting. If you would like to find out more about coaching opportunities within Derbyshire click here. To find out more about the Derby City SSP Leadership Academy click here. To find out about all volunteering opportunities in Derbyshire click here.